Lily's Quilts: Interested in a quilt pattern giveaway? Interested in a quilt pattern giveaway? If so, you're in the right place! Do you know Rebecca who blogs over at Chasing Cottons? 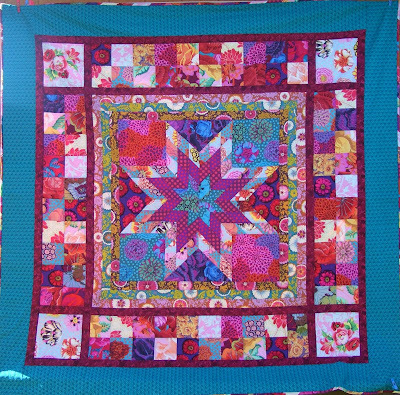 She designs fabulous quilts and her patterns are available for immediate download from her shop (here). I first came across her at this year's Blogger's Quilt Festival where she revealed her Curlicue Crush pattern which I fell in love with and gushed over shamelessly as I am afraid I do when I get really excited about seeing something new and different. I love how exotic this quilt looks and also thought, from the moment I saw it, that I need to make it in Christmas fabrics - to me it looks like the baubles on a Christmas tree. I have since followed Rebecca's blog and seen more of her quilt designs which I really love and thought you would love them too so, after a bit of arm twisting, Rebecca has very kindly agreed to let you have a chance of winning some of her patterns. Hurray and thank you Rebecca! So Rebecca has very kindly agreed to give away two quilt patterns each to four lucky readers of this blog. For a chance to win this giveaway, what do you have to do? Well, it's simple, just let me know which two patterns you would choose, if Mr Random Generator picked your number. Head over to the Rebecca's pattern shop here, pick two and come back and let me know which two you like the best. Followers (new and old) of Rebecca's blog get a bonus comment, just add a comment saying "bonus comment". Good luck and I will announce the four lucky winners this time next week (Sunday 13 March). And, in case anyone just can't wait to get their hands on one of these patterns, Rebecca is giving my readers a special offer for this week only which is that, if you buy one of her patterns, she will give you one free. Just buy one pattern through her shop then email Rebecca with your choice of free pattern with the code "Lily's Quilts Offer" in the title and she will send you a second pattern absolutely free. And, if you happen to be drawn as one of the winners of the giveaway, she will reimburse your original payment. Oh yay! These quilts are beautiful! I would so totally pick Cirlicue Crush and Star Jewels! Thanks for the intro to Rebecca's blog too, going to have a bit more of a pokey around there now. Oh, I <3 Rebecca's patterns! I would choose Star Jewels and Diamond Bouquet. Thanks for the chance to win. I would get Edens Garden and Cirlicue Crush. Her patterns are fab! I love Rebecca's designs. Love them! I'd choose Star Jewels and Curlicue Crush. They`re all gorgeous but if I have to choose - Curlicue Crush and Diamond Bouquet. This is a great giveaway - thanks! Rebecca's designs are wonderful, Curlique Crush is a brilliant design and you're so right about it looking like Christmas baubles! And Star Jewels, no Diamond Bouquet, err..umm... it's hard to decide.. I'll have to toss a coin. I saw the curlicue crush quilt somewhere recently and fell in love with it, so definitely that one, and also Star Jewels. Rebecca is such a talented designer! I would love Curlicue Crush--and think your Christmas ornament idea is brilliant. I'd also like to give "Eden's Garden" a try. Thanks much for the giveaway and the coupon code. oooh, ooh ooooo, Curlique Crush and Star Jewels. I made fabric baubles like the shapes in CC this Christmas so I know it would look fab in Christmas fabric. Looks a bit tricky though .... congratulations on your excellent arm twisting skills! Star Jewels and Curlicue Crush are my favs! Thanks for the giveaway Lynne! Bonus comment- I've been a follower of Rebecca for a while now. I want to try out her birdcage block sometime VERY soon! I follow (and adore) Rebecca. Thanks for letting me know about the bonus entry. I would *love* to win these patterns! I love Rebecca's designs, I've been following her blog for a log time now. If I had to pick two, they would be Curlicue Crush and Eden's Garden. Thanks so much for the give away and the coupon code too. I love Curlicue Crush & Star Jewels - I've got some gorgeous Kaffe Fasset prints that would work with both of those! Bonus comment - I'm a follower! Great idea Lynne! The patterns are fabulous! I don't think I'll be able to wait for the draw next week to get my mitts on one of these. I love the star jewel and the curlicues. I can't wait for the Birds of paradise pattern to be out either! Bonus Comment - I am a follower. I would love Edens and Sandcastle patterns. Rebecca is one talented girl. Awesome giveaway! My two favs are "Curlique crush" and "Edens garden." My choice would be Eden's Garden and Diamond Bouquet. Rebecca's patterns are lovely. Happy quilting. Oh, I love her designs! I have tried out her curlicue crush pattern (a lot of curves!). I didn't have the patience to cut more fabric then for a baby quilt but it turned out pretty cute. If I won I would chose Eden's garden and of course sand castles. I can't decide...I like three! Sand Castle (for all my new little nieces), Eden's Garden cause it's pretty, and Curlicue Crush because it has a worldly feel to it. Thanks for sharing these! I love Birds of Paradise and Sand Castles. I also am a follower of Rebecca. Look at those little squares pieced into the border of the second quilt. Just amazing. Thank you for twisting her arm. I love rolling meadowna and sandcastles! thanks! Eden's Garden and Star Jewels would be my pick. I was going to write bonus as I know I follow Rebecca's blog. Good thing I checked first. I guess I have just been a stalker of her blog. Now I follow it so BONUS COMMENT! Woohoo! I have been eyeing these patterns for awhile and the discount clinched it! I purchased Curlicue Crush and asked for Star Jewels as the free pattern. I LOVE Rebecca's patterns. I have the sand castle one and have been following her for some time. Thanks for the giveaway! I LOVE ROLLING MEADOW AND SANDCASTLE! Oops shouting! Sorrow I got too excited! Curlicue and Diamond Bouquet are my favorites--I've been admiring Rebecca's pattern's every time I see them! Curlicue Crush and Sand Castle are my favourites. Now you mention it Lynne I could just see Curliecue in Flurry, Countdown to Christmas or Reindeer games. I'm already a follower on Rebbeca's blog. thanks for the chance to win. I like Sand Castle and Eden's Garden! I love curlicue crush & star jewels :o) Thanks for the chance! O what q great giveaway, I've been following Rebecca's blog for a while now and love her designs. Plus she's super lovely and has given me great advice :-) I would love Curlicue crush and Sandcastles but it's so hard to choose! Curlique Crush and Eden's Garden. Thanks for arranging the give away. Her patterns rock. Curlicue and Star Jewels! They are all so pretty. I love the curly cue crush and the star jewels. Thanks for the giveaway. I love Sand Castles and Star Jewels.Thanks for a chance to win! It's Curlicue Crush and Sand Castle for me - please. Thanks for the chance! Eden's garden and sand castle patterns are wonderful!!!!! Bonus quilt, oh, I mean. Comment! I would like sand castles and eden's garden! I have been wanting to try some beginners curved piecing! So generous of Rebecca to give away not one, but two quilt patterns! I headed over and looked at them and my favorites are (and it was hard to choose), Star Jewels and Curlicue Crush. She does lovely work! thanks for the chance. I've followed her for a while now too, drooling over her designs. She really does do some amazing work! I love the Eden's Garden and Curlicue Crush! Thanks for this opportunity! Bonus comment. And thanks again! i would love Eden's Garden and Curlicue Crush! she designs such gorgeous patterns! bonus comment - i've been following rebecca's blog since almost day one! thank you both for the giveaway! I love Curlique Crush and Rolling Meadows! My favourites are Curlicue Crush and Sandcastle! i love her patterns! i would love the Curlicue Crush pattern. it is my fav! i'd choose the curlicue crush and star jewels patterns. Awesome! "Eden's Garden" and Curlicue Crush"
I was just looking at the Curlicue Crush pattern yesterday--how weird is that? Must have been feeling the giveaway vibes. :) I'd love the Curlicue Crush and Star Jewels. Rebecca is great, isn't she? I would go for the curlicue crush and her castles...I even have both sets of those fabrics on hand! Rolling Meadows and Star Jewels for me. Thanks for sending me to Rebecca's blog. What beautiful quilts. I like the Star Jewels and the Eden's garden. Curticue crush is also an interesting pattern. Yes a great quilt for Chrismas. i would choose sand castles and rolling meadow....they look beautiful. I'd like Sand Castle and Star Jewels, thank you. I really like the Curlicue Crush and the Sand Castle patterns. I'd have to pick Curliecue Crush and Rolling Meadows as I'm a beginner and love simple repition that can show of some luch fabrics! Sand Castles all the way! Rolling meadows too. Good Luck everyone! Bonus comment, I've been following Rebecca! and 'Curlicue Crush'. Thanks for the chance at the giveaway. I love Star Jewels & Diamond Bouquet-actually I love all of them! Bonus comment-have followed Rebecca's blog for quite awhile & love it! I LOVE quilt patterns and hers are just gorgeous! It took me a few minutes to decide but I would have to choose 'Diamond Bouquet' and 'Sand Castle'.... of course I may just be purchasing a few others too! Thanks for this chance to win! What a great giveaway! "bonus comment" ~ What a great blog she has! I'd love to make a Curlicue Crush quilt and Sand Castles is completely adorable, so they would be my choices. Eden's Garden and Curlique Crush are my favourites. Thanks for the chance to win them. I would love to make a quilt from the Curlicue Crush or Star Jewels. (Plus the word Curlicue is just a yummy word). Thanks for hosting the giveaway. I would most enjoy trying Star Jewels and Diamond Bouquet! Thank you for the chance!! Oh fab giveaway - curlicue Crush and Star Jewels would be my top choice. Curlicue Crush and Sand Castle - love them both! I'd love to get Eden's Garden and Curlicue Crush! THANKS for the chance ~ I LOVE her designs! Please count me in! I'd choose the Curlicue Crush and the Sand Castles (I can see it made out of Castle Peeps!). Please Mr. RNG, pick me! pick me! pick me! I love the curlicue crush and diamond bouquet! I love Diamond Bouquet & Star Jewels!!! AWESOME giveaway! My favorites are Eden's Garden and Curlicue Crush. These quilts are beautiful! I would pick Curlicue Crush and Edens Garden. Wow, they are all great! Love the sand castles and curlicue crush, but the two I would most likely actually make are "Rolling Meadows" and "Diamond Bouquet." Thanks for the chance to win! These are so lovely! I already have the Curlicue Crush pattern (so gorgeous! ), so I'd choose Sandcastles and Rolling Meadows. I would choose Curlicue Crush and Sand Castle. They are lovely! Such beautiful quilts! I would definitely choose Curlicue Crush and Rolling Meadows. Im completely in love with the sand castle pattern. I bought a 18 FQ set of "Castle Peeps" to make with this pattern. Would love to win it! I also really like the Curlicue Crush pattern - very original design. Eden's garden and the Curlique Crush...that second one is definately on my to do list! I just love the curves! Sandcastle and eden's garden are my favorites. Sand Castles and Star Jewels are two great patterns. Mandatory Entry: i like sand castle and diamond bouquet. such lovely quilts@! I follow her on google connect "anash"
I like Star Jewels and Curlique Crush. I like the curves. Oh, I would love to win Curlique Crush! It is so unique and I would use my Christmas fabric to make it. I have just discovered both your and Rebecca's blog with a bit of early morning lurking, her quilts are fabulous, thanks for the link! Maybe Star Jewels and Edens garden might be up there but so hard to choose, they are all delightful! Ooh and now I qualify for a bonus comment for the great privilege of following Rebecca's blog. Always love finding fellow Aussies on their sewing adventures! Thanks for the giveaway! I'd choose Curlique Crush and Star Jewels. I really love rolling meadows and birds of paradise (even though it's still coming soon), I have the curlique crush and can't wait to start on it... That is if I get all of my wish list projects done! I HAVE to have the Sand Castles and the Birds of Paradise patterns. Thanks for sharing the work of such a creative person! Please put me in for a BONUS COMMENT too! 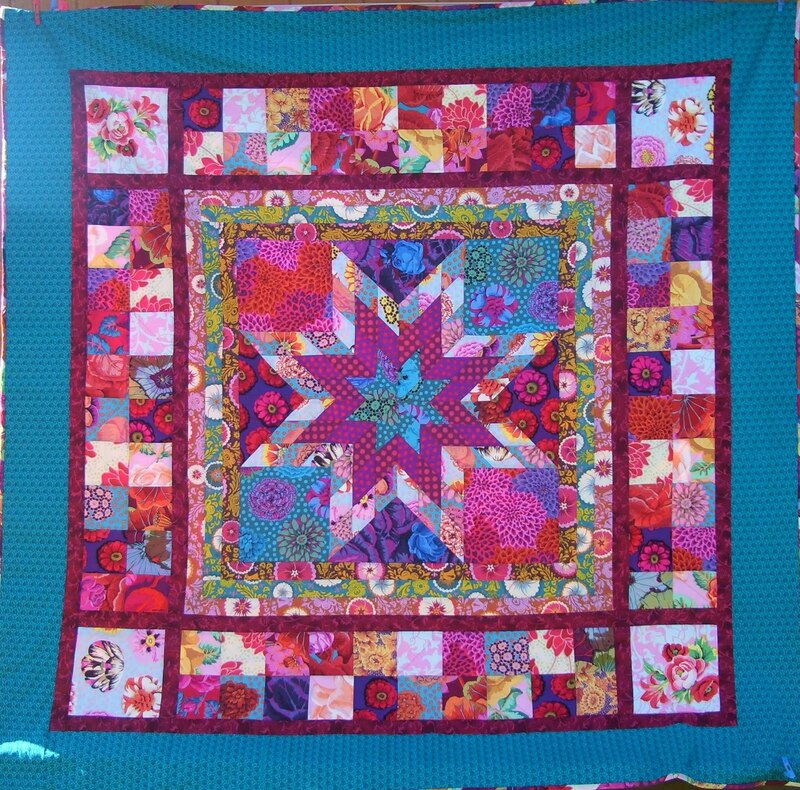 Lovely patterns and quilts - I like Diamond Bouquet and Star Jewels! Sandcastle and Diamond Bouquet for me for sure! What a lovely giveaway! I would love Eden's garden and Sand Castle! Bonus comment...I follow Rebecca's blog! =) Thanks again! My choices are Eden's Garden and Diamond Bouquet Thanks!!!!! I love 'Eden's Garden' and 'Curlicue Crush'!!! I love rolling meadows and sand castle!!! I would select Sand Castles and Diamond Bouquet. Thanks for the chance to win these beautiful patterns. I would pick Cirlicue Crush and Star Jewels! Thanks!! I LOOOVE Curlicue Crush and Birds of Paradise. I would definitely pick those 2. Thank you for hosting such a nice giveaway! Rebecca's designs are fantastic, so hard to choose......Curlice Crush is a fav and maybe Rolling Hills. Thanks for the chance!! Oh I would choose Cirlicue Crush and Birds of Paradise. What a great giveaway! Eden's Garden and Curlicue Crush, please! Curlicue crush and rolling meadows... although they're all fab. I would pick Rolling Meadows and Star Jewels! But they are all beautiful. Sandcastle and rolling meadows are my favorites! Thanks for the chance! Bonus entry -- I follow Rebecca! I love the Curlique Crush and Sand Castles the best. I love the Sand Castle Quilt, and Eden's Garden. they are just so amazing. Diamond Bouquet and Star Gazer are my favorites but I have been a fan since I saw the castle quilt. I'd choose Star Jewels and Curlique Crush. Rebecca's patterns are gorgeous! I would pick 'Curlicue Crush' and 'Star Jewels'.